Is it worth it to make your own granola at home? I test out a homemade version versus a few popular store-bought brands. 1) Preheat oven to 325° Fahrenheit. Mix oats, almond slivers, seeds, spices, and salt together in a large bowl. 2) Once oat mixture is evenly mixed, drizzle in honey and stir well to combine. 3) Spread out granola mixture on two baking sheets lined with parchment paper. 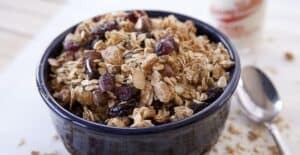 4) Bake the granola for 20-25 minutes and stir the granola every five minutes to prevent it from burning. It will most likely cook faster on the outer edges of the pan so stir it well to redistribute the heat. If the granola is burning or cooking too quickly, turn your oven down 25 degrees and continue stirring regularly. 5) Once granola is baked, let it cool for a few minutes and then stir in dried fruit. 6) Store granola in an airtight container at room temperature for up to three weeks. This delicious recipe was brought to you by Macheesmo. Read the full post at https://wp.me/pkSYO-8FH.